Marijuana refers to the dried leaves, stems, flowers, and seeds from the hemp plant Cannabis sativa. The main active ingredient in marijuana is the mind-altering chemical delta-9-tetrahydrocannabinol (THC). 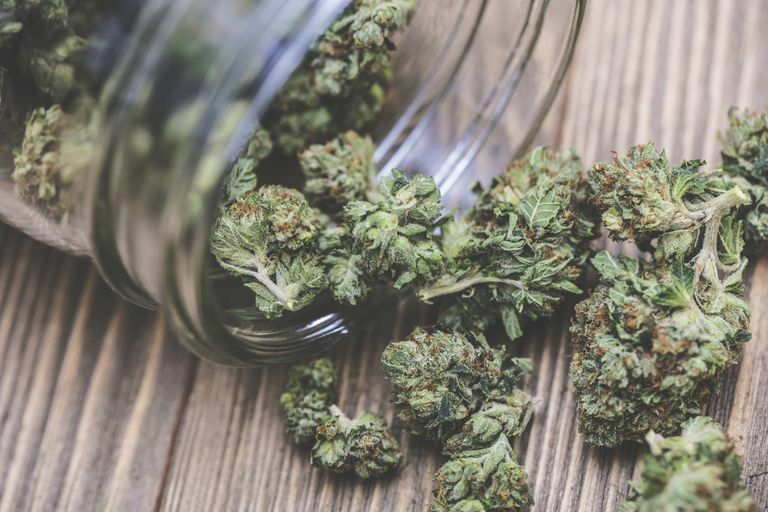 Though its legal use is growing for both recreational and medicinal purposes, marijuana is still the most popular illegal drug used in the United States. Whether you smoke pot, are a concerned loved one, or are considering the drug, this primer can help answer some basic questions you may have. There are over 200 slang terms for marijuana, including pot, herb, weed, grass, widow, boom, ganja, hash, Mary Jane, cannabis, bubble gum, northern lights, fruity juice, gangster, Afghani #1, skunk, and chronic. Marijuana looks like a shredded, green-brown mix of plant material. The most common way to take marijuana is to smoke it. Users will roll it into a cigarette "joint," refill an emptied cigar casing to create a "blunt," or smoke it in a pipe or a water pipe "bong." A newly popular method of use is smoking or eating different forms of THC-rich resins extracted from the marijuana plant. It can also be baked into food (edibles), such as brownies, cookies, or candy, or brewed as a tea. Marijuana is the most common illegal drug used in the United States. According to a national survey on drug use and health from 2016, 44 percent of Americans over the age of 12 have used marijuana. As of the 2018 midterm elections, 10 states and Washington, DC, have legalized marijuana for recreational use for adults over the age of 21. Over 30 states have laws on the books legalizing marijuana for medical use only, while several others have only legalized oils with low-THC content. Marijuana is still illegal under federal law. The membranes of certain nerve cells in the brain contain receptors that bind to THC, kicking off a series of cellular reactions that ultimately lead to the high people experience when they use marijuana. People use the drug because it elevates their mood and relaxes them. Depending on the level of THC, users may also experience euphoria, hallucinations, and paranoia. Some of the common discomforts found when using marijuana include dry mouth, swollen eyelids, bloodshot eyes, loss of coordination, and an accelerated heart rate. Chronic marijuana smokers may have many of the same respiratory problems that tobacco smokers have, including daily cough and phlegm, symptoms of chronic bronchitis, and more frequent chest colds. Continuing to smoke marijuana can lead to abnormal functioning of lung tissue injured or destroyed by marijuana smoke. While some of these risks can't be mitigated, there are things you can do to address—at least in part—some of the above, if you choose to smoke. Research suggests that between 9 percent and 30 percent of those who use marijuana may develop some degree of marijuana use disorder. Long-term marijuana users are more susceptible to addiction. People who begin using marijuana before age 18 are four to seven times more likely than adults to develop an addiction. Drug craving and withdrawal symptoms can make it hard for long-term marijuana smokers to stop abusing the drug. People trying to quit report irritability, sleeplessness, and anxiety. They also display increased aggression. A drug is considered addictive if it causes someone to compulsively, and often uncontrollably, crave, seek, and use it, even in the face of negative health and social consequences. Marijuana meets this criterion. There's no medication to directly treat marijuana abuse. Most abusers seeking professional treatment receive behavioral treatment in either group of individual sessions or both. If smoking weed becomes a problem for you, ask a family member, friend, or doctor for help, or call the Substance Abuse and Mental Health Services Administration's national helpline at 1-800-662-HELP (4357). Hasin DS, Saha TD, Kerridge BT, et al. Prevalence of Marijuana Use Disorders in the United States Between 2001-2002 and 2012-2013. JAMA Psychiatry. 2015;72(12):1235-1242. National Institute on Drug Abuse. Marijuana. Winters KC, Lee C-YS. Likelihood of Developing an Alcohol and Cannabis Use Disorder During Youth. Drug Alcohol Depend. 2008;92(1-3):239-247. What Are Some Things That Can Happen to You on Weed? Are Clove Cigarettes a Healthy Way to Smoke? Can Young Adults Develop an Addiction to Marijuana?